The Times seems to have acquired a new writer, another one behind the paywall. 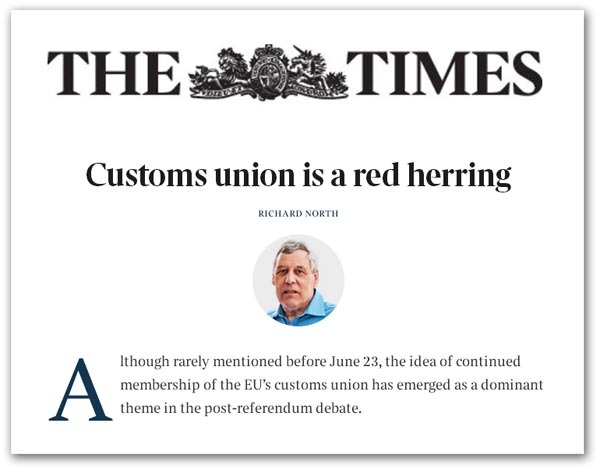 The article, headed: "Customs union is a red herring" is 600 words long, illustrating quite how difficult it is to compress an argument about such a complex subject in such a short space. Furthermore, it seems to have sparked a sharp controversy in the comments section, and amongst people who seem determined to miss the point. The essence of the issue is that it is possible, as a matter of principle, to enter into a customs union and then to make separate trade agreements with third countries. There is nothing, as I write, implicit in a customs union which prevents this. Certainly, though, there are contradictions in entering into a customs union and then seeking agreements with third countries. The question is, why would a country want to? The main purpose of a customs union is political, a precursor to political union. This is why the German states entertained a Zollverein in 1834 and why the Six created the EEC in 1957. It is also why Turkey decided to join a customs union with the EU in 1995. It was a preparatory stage to becoming an EU member. That, of course, does not stop the barrack room lawyers coming out to play in The Times comments, citing Article 13 of the EU-Turkey Customs Union decision. This, we are told, requires Turkey to align its external tariff with that of the EU, "so it can only make deals within this tariff boundary". But, while that much is true, the Article refers to Turkey "harmonising its commercial policy with that of the Community". In other words, this confirms precisely the point that I've made, that prohibitions (and restrictions) on external deals stem not from the customs union, per se, but from the parallel common commercial policy. In customs union agreements, common commercial policies are a usual adjunct. But they are not a necessary component. In principle, it is possible to have a customs union without an agreement on a common commercial policy. With Mercosur, which is a customs union, there seems to be no bar to members making their own separate trade deals. And missed by the barrack room lawyer is the interplay between Articles 13 and 14 of the EU-Turkey customs union. Article 13(1) states that Turkey shall, in relation to countries which are not members of the Community, align itself on the Common Customs Tariff. However, when we come to 14(3), it says that, "if Turkey wishes to suspend on temporary basis or resume duties … Turkey will make a prompt notification to the Community". Even in this agreement, there seems to be a get-out. However, all of this is supremely irrelevant to the overall debate – which is the theme of the piece. We need, according to the perceived wisdom, to stay in the customs union in order to avoid incurring extra customs checks after Brexit. But, as I remark in my piece, the idea that we must remain in the customs union to avoid customs checks is absurd - the issues are completely unrelated. For sure, if we leave the EU without an agreement on the single market, or a separate customs co-operation agreement, the UK would have problems, as the chancellor Philip Hammond warned last week. There are no adverse consequences from leaving the customs union. The only "loss" is a release from the obligation to send the proportion of CET we collect to the EU budget, which is a requirement of membership. Since that currently runs to about £2 billion a year, there is no case for remaining a member. In all respects, as an issue, the customs union is a red herring. But, as Pete points out, there are no black and white issues here. So, even with the best will in the world, trying to explain customs unions in 600 words isn't going to work. It needs something like this. But nothing will convert the wilfully ignorant (and the obnoxious).